I’m going green and fresh today! 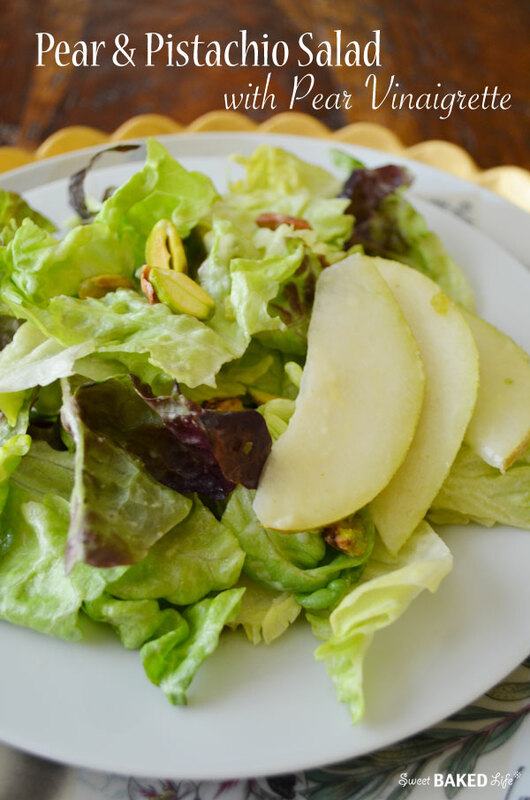 So get ready to jump into summer with this delightful Pear and Pistachio Salad with Pear Vinaigrette! It’s super easy to make and it’s got the perfect combination of sweetness and tang with an incredible crunch from the nuts. The dressing is light and refreshing — and better than anything pre-made! You see my husband recently has gone on a “health kick”. Yes, it is hard to do that around my home with all the baking and sweet stuff! He does have a huge sweet-tooth and is now trying to eat a bit more on the healthy side. Good for him!!! So to help him with his progress, I decided to make this Pear and Pistachio Salad with Pear Vinaigrette. And let me tell you, he loved it! Of course, so did I! And making your own dressing can be done in just a snap and it’s so much better for you than the bottled stuff. Don’t waste your calories on salad dressing — you can do that with some yummy baked goodies (LOL)! Add diced pear, vinegar, olive oil, lime juice, lime zest, salt and pepper to a blender and mix on high-speed until dressing is smooth. Pour into small container. This will make about 3/4 cup. In a large bowl, add about 4 tablespoons of the vinaigrette, then add the lettuce and toss well (I do this part with my clean hands). Adjust the amount of dressing to your liking. I personally like my salads lightly dressed. Then add the thinly sliced pears and pistachios and gently toss. Divide amongst salad plates or bowls. Makes 2-4 servings. 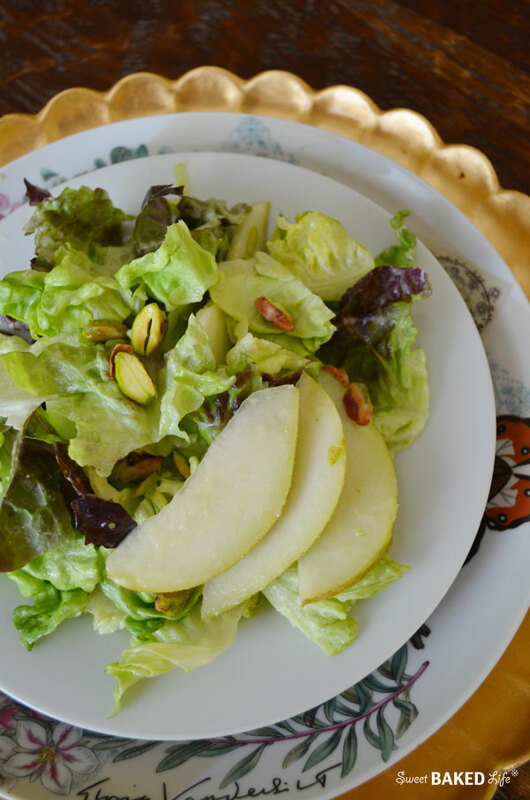 Nothing better than fresh lettuce and juicy pears along with tangy lime and crunchy pistachios. So get your fork ready to dig into this simply delicious Pear and Pistachio Salad with Pear Vinaigrette, you’ll be glad you did! Ooo I just love that pear vinaigrette! Sounds super. Thanks, and it really is so yummy! My new “go-to” dressing! Thanks for sharing! I made this salad for dinner tonight, and it was fabulous! So light and so full of flavor. Just the perfect summer salad! Thanks Kellie! Glad you liked it! Happy summer!!!!!! This sounds nice and fresh, I’m looking for more salad recipes so pinned this and want to try soon! Sheila, love the combination of flavors you gathered for this gorgeous salad! Thanks Gloria! Hope you are having a wonderful weekend!